He was the author of numerous books, and many more have been written about both him and his teachings. For an unrivaled selection, great prices, and free shipping to US customers, CLICK HERE. Among his most popular books are The Mind (with Gurucharan Singh) – the owners manual for the human mind and spirit, Praana Praanee Praanayam - about breathing and breath techniques, Man to Man - his men's teachings, Kriya - Classic Kundalini Yoga Sets, Meditations & Kriyas, Rebirthing – become awakened, rejuvenated and present to your purpose, and I Am a Woman Yoga Manual containing his women's teachings. You will find a complete listing of his books at the foot of this page. Low prices and Free US shipping. Many of Yogi Bhajan’s students from the early days are still actively passing on his teachings to new generations of students all over the world. He strongly encouraged Guru Rattana PhD to publish a series of manuals based on the teachings at those early classes – Transitions to a Heart Centered World, Relax and Renew & Sexuality and Spirituality have sold many thousands of copies and are still as popular today as they were then. Yogi Bhajan's first student in the US was Shakti Parwha Kaur Khalsa. She met him in December of 1968 when he arrived in Los Angeles. Shakti acted as his personal assistant, secretary and chauffeuse and within 2 months she was teaching Kundalini Yoga at YMCAs. She took many notes at Yogi Bhajan’s early classes, notes which would later be printed as Sadhana Guidelines. Yogi Bhajan defied the tradition of secrecy because he saw that his technology offered an alternative to the then prevalent drug culture. He knew that Kundalini Yoga had the innate power to give seekers a real experience of God within, and at the same time help them to heal their mental and emotional problems -- as well as the physical bodies that had been damaged by the use of drugs. He was one of the most down-to-earth spiritual teachers of our time. He taught his subject with wit, compassion and a practical sense of the challenges faced by us all in everyday life. He firmly believed in the democratization of spirituality, teaching whoever was ready to listen and willing to practice. His early classes in the Los Angeles area were exceptionally popular. His Kundalini Yoga was a huge success at the Woodstock Festival in 1969 and is largely credited with helping to maintain a peaceful and harmonic ambiance at a chaotic event which could so easily have descended into public disorder on a massive scale. The Kundalini Yoga lifestyle taught by Yogi Bhajan includes a vegetarian diet and early morning sadhana - the practice of Kundalini Yoga and meditation in the ambrosial hours. Facilitating the development of a more positive, loving and enlightened awareness, it makes possible a beneficial life transformation, while also improving overall health. Amid the swirling, confusing, unfocused energies of the modern world, there is a light, a calm and a healing in the center of all things - Yogi Bhajan, Master of Kundalini Yoga. Yogi Bhajan left this world on October 6th 2004 at his home in Espanola, NM. He died of complications of heart failure. He is survived by his wife of 50 years, Bibiji Inderjit Kaur, two sons and a daughter. 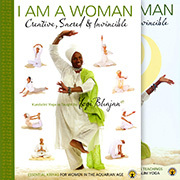 Yoga Technology have an unrivaled selection of Yogi Bhajan Kundalini Yoga Books and DVDs covering every aspect of his teachings, not just the how but the why too. See also Kundalini Yoga and Yogi Bhajan. Below you will find our selection of products by Yogi Bhajan. Enjoy our low prices and FREE US Shipping.